This really is the perfect gift to celebrate the birth of a baby boy. It features some traditional favourites in blue and white, including germinis and a superb large-headed rose, all carefully arranged in a clear glass vase with a blue sisal collar. 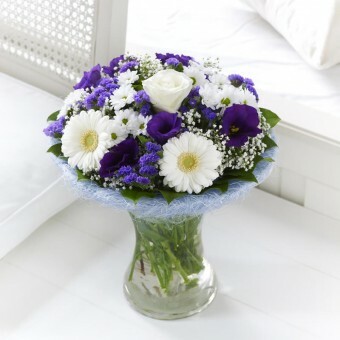 Featuring a white large-headed rose, white germini and white spray chrysanthemums, purple lisianthus and statice, with white gypsophila and salal, all carefully arranged in a clear glass vase with a blue sisal collar. VASE INCLUED.